Biomes in Minetest are a part of the map generation. 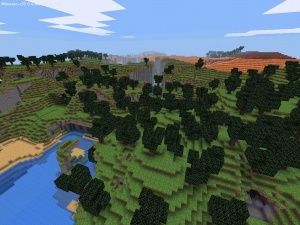 Biomes are areas with similar ground and underground and vegetation. The biomes depend on the map generator used. Most map generators have the same biomes, but v6 is different. Note: Blocks written in bold in the “Blocks” column are the land surface blocks of this biome. Biomes in these map generators are defined by mods. If these are not defined, these map generators only generate stone worlds. 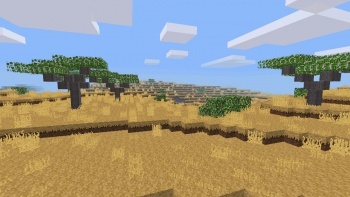 Biomes in these map generators are not linked to the terrain shape; this means any biome (including grasslands) can form in flat or very mountainous areas. 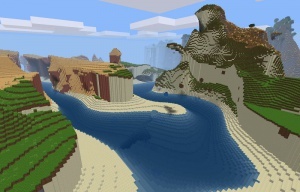 This section shows the biomes used by Minetest Game. Grass, Flower, Bush Leaves, Bush Stem, Blueberry Bush Leaves, Blueberry Bush Leaves with Berries Grassland has large amounts of Dirt nodes and Dirt with Grass blocks, on which flowers, Grass and bushes (including blueberry bushes) may appear naturally in this area. The underground is made of stone. Pine Tree, Pine Needles, Fern, Red Mushroom, Brown Mushroom Coniferous forests grow in colder areas and a notable for their unique floor. They are filled with a dense vegetation of ferns and pine trees, which come in two different shapes: One with “square” canopies and a “pointy” one. Between the dense fern, occassional mushrooms can be found. Fallen pine tree logs (on which you can sometimes find a red mushroom) can be found as well. 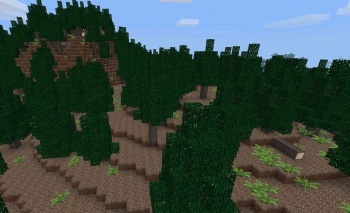 A similar biome is the taiga (see below). The “pointy” pine trees in a Pine tree forest in 5.0.0. Apple Tree, Apple Tree Leaves, Aspen Tree, Aspen Leaves, Apple, Flower, Red Mushroom, Brown Mushroom, Bush Leaves, Bush Stem Deciduous forests form in temperate zones and are home to apple trees and aspen trees. Like in other forests, logs of fallen trees can be found here. Deciduous forests are frequently bordering surround grasslands. Jungle Grass, Jungle Tree, Jungle Leaves, Brown Mushroom, Waterlily Rainforests (or jungles) are made of large jungle trees which grow thickly packed together. 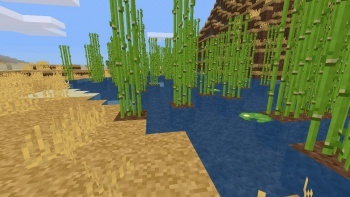 Jungle Grass and Jungle Trees bearing Jungle Leaves spawn here naturally. On fallen jungle tree logs, brown mushrooms may appear rarely. Dry Grass, Acacia Tree, Acacia Leaves, Acacia Bush Leaves, Acacia Bush Stem The savanna is a dry land which is not a desert. It is populated with plenty of dry grass and occasional acacia trees and acacia bushes. There are also a few fallen logs of acacia trees. Cactus, Dry Shrub Deserts contain large amounts of desert sand and desert stone. In the desert stone, there are continuous strata of sandstone and desert sandstone that extend throughout the world. Small blobs of sand might be found in the desert stone as well. Cacti and dry shrubs also gorw here naturally on desert sand. Cacti can form in two different shapes. Deserts form in hot and dry areas. Dry Shrub Sandstone deserts are large barren areas covered by sand with sandstone below. They form in temperate and dry climates. Dry Shrub Cold deserts are large barren areas covered by large amounts of silver sand on top of stone. In the stone, there's a continuous stratum of silver sandstone that extends throughout the world. 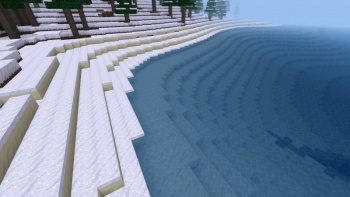 This biome forms in cold and dry areas. Bush Leaves, Bush Stem The snowy grassland biome usually borders grasslands and is completely covered by a thin layer snow on top of dirt with snow. A few snow-covered bushes can be found here. 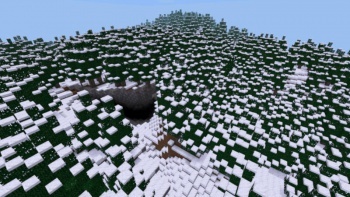 Pine Tree, Pine Needles, Pine Bush Stem, Pine Bush Needles, Dry Shrub, Red Mushroom Taigas are cold snow-covered biomes with rich vegetation with snow and dirt with snow as surface. They are populated with snow-covered pine trees and pine bushes. Like in the coniferous forest, the pine trees grow in two different shapes. On fallen pine tree logs, red mushrooms can sometimes be found. Tundra Snow, Permafrost, Stone Tundras are barren biomes in very cold climates with a surface of permafrost and the only vegetation is moss on Permafrost with Moss. They are usually found between taigas, snowy grasslands and glaciers. Gravel The ice sheet biome forms only in the coldest regions and is made of large amounts of ice, covered by a thick layer of snow blocks without any vegetation. 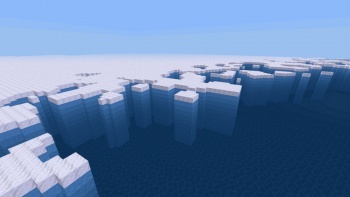 Ice sheet biomes can be either mountain-like, forming large glaciers as in the screenshot or very flat, creating large empty snow fields. In the valleys mapgen, ice sheet biomes have frozen rivers like in tundras. These biomes form between land biomes and ocean biomes. Marram Grass Dunes are made of sand on which occassional marram grass grows. They form at 3-4 blocks above sea level and border grasslands and coniferous forests. Waterlily A deciduous forest shore is the area exactly at sea level bordering deiduous forest biomes and has dirt as its floor (instead of sand). In the shallow water there is a chance to find waterlilies. Jungle Tree, Jungle Leaves, Waterlily A rainforest swamp is a small biome which only forms at sea level next to a rainforest. Rainforest swamps have jungle trees like the rainforest, but their roots are flooded with water. Waterlilies may occour here on shallow water. Papyrus, Waterlily Savanna shores are usually small areas of shallow water with a dirt floor. They occour when a savannah reaches the sea level. There are plenty of papyri growing on single dirt blocks, but it is the only place in which papyri occour naturally. A couple of waterlilies may be found on the shallow water as well. Taiga beach Water, Snow, Sand When a taiga meets the ocean, it creates sand beaches that are covered with sand. Tundra beach Water, Snow, Gravel A tundra beach consists of lots of gravel with occasional snow and may form when a trundra meets the ocean. Oceans are large bodies of water and have sand as the sea floor with occacional patches of clay. There are several ocean biomes in Minetest Game, one for each land biome. Each ocean biome has the same temperature and humidity requirements as its land counterpart. The defining feature of the ocean biomes are, of course, the oceans, but they actually extend way below the ocean floor of most oceans, down to to Y = -112. So ocean biomes also affect the appearance of the underground. 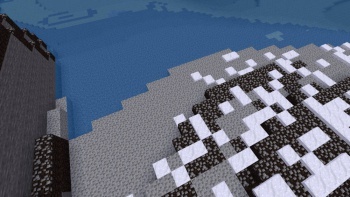 Tundra ocean Water, Sand, Clay, Stone The tundra ocean is the ocean biome that corresponds to the tundra. 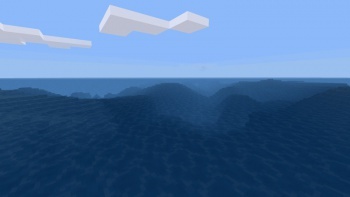 It could be seen as the “stereotypical” ocean biome, as the other ocean biomes share have most of the properties as this one. It has sand as the ocean floor, on top of stone. 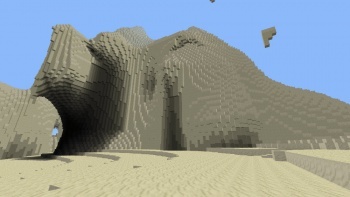 Like in all ocean biomes, blobs of clay are common inside the sand and occur between levels Y=0 and Y=-15. Kelp Like the tundra ocean, but on the sand there grow occassional kelp. Sandstone desert ocean Water, Sand, Clay, Sandstone Ocean pendant of the sandstone desert. Like above, but it has sandstone instead of stone as underground material. Kelp grows here in the same manner. Coral (block), Coral (rooted), Coral Skeleton Savanna and rainforest oceans are the oceans bordering savannas and rainforests, respectiveley. Colorful coral reefs can form in the water close to the surface with all species of coral packed closely together. Coral, Coral Skeleton Ocean variant of the desert. The underground material is desert stone. Coral reefs can form in the water close to the surface, in the same way as in savanna and rainforest oceans. Ice sheet ocean Snow Block, Ice, Water, Sand, Clay Ice sheet ocean is the ocean pendant to the ice sheet biome (at land) and thus forms only in the coldest regions of oceans. This biome is named after the tall ice sheet that covers the ocean. The ice sheets are quite tall and consist of a single layer of snow blocks with up to 10 layers of ice beneath, “floating” above water in deep oceans. Shallow oceans and lakes might even be completely frozen. The underground below is either made out of ice or stone, creating interesting ice caves sometimes. This refers to the part of the world that is at or below Y coordinate -113 (directly below the ocean biomes) and it extends all the way to the bottom of the world, although most players would consider “the Underground” to be everything below sea level. Note the ocean biomes go very deep into the underground as well. 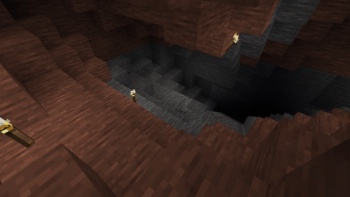 And indeed, most features of the underground biome, like ores, can be found in higher places as well. Underground Stone, Air, Silver Sand, Dirt, Gravel, Water, Lava, Ores This is a technical biome in Minetest Game and the only underground biome. It is almost exclusively made of stone, with occasional caves. There are occassional underground lakes of water and lava, making underground exploration slightly dangerous. Smaller blobs of silver sand (but not ordinary sand! 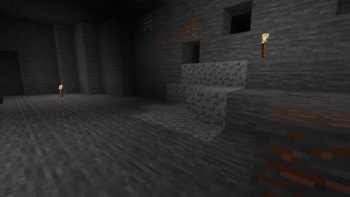 ), dirt and gravel can be found all around the underground, but these are common everywhere where stone can be found. 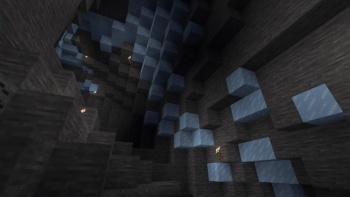 Since the underground is made out of stone, all the ores can be found here (although the ores are not restricted to this biome, in fact, they happily generate whereever stone can be found). The deeper you go, the more precious they become. Most of the time, the caves in the underground biome are indistinguishable from most caves in the ocean biomes, because of all the stone. This is not true for all ocean biomes. A transition from “ocean biome” to underground becomes obvious when you you started digging in a biome that doesn't have the (normal) stone, like the desert or sandstone desert biomes. In that case, the transition from the ocean biomes to the underground biomes is very visible, as can be seen in the screenshot to the right. 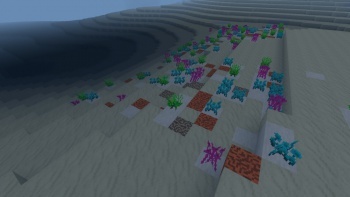 Another sure sign that you're in an ocean biome, not the underground biome (yet) are clusters of (normal) sand, which don't exist in the underground biome. 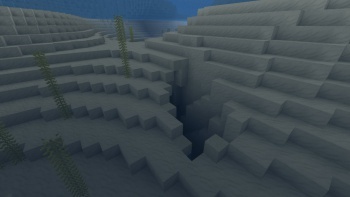 This is an oddity of the map generator which placed the ocean floor material inside a cave somehow. Biomes in v6 are rather simple, but there are some unique features not found in other mapgens. This mapgen has a few biomes and 3 tree species. 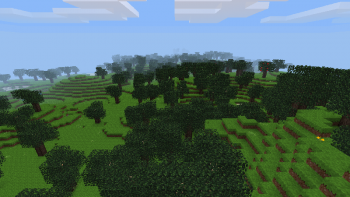 In, v6, the biomes do determine the terrain shape to some extent. 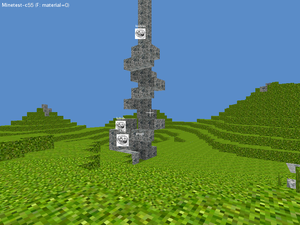 In Minetest Game, some blocks are not generated at all, but nothing essential. For example, there are are no aspen trees, acacia tree and corals. Technically, the v6 map generator has a predefined set of biomes which can't be changed by mods directly. The outcome in different games will generally be very similar. Games usually only add to the v6 mapgen by creating so-called decorations, for example flowers and grass. Apple Tree, Apple Tree Leaves, Apple Grass, Flower, Brown Mushroom, Red Mushroom, Butterfly, Firefly The Normal biome is the most common biome in v6 and forms in temperate zones. It includes grassy plains and apple tree forests. This biome is rather flat and covered by Dirt with Grass. The plains are large expanes of land. 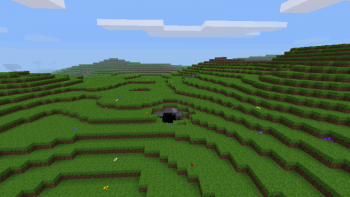 In Minetest Game, Grass and flowers are spread over the entire biome; mushrooms may grow next to the apple tree trunks. Desert Desert Sand, Desert Stone Cactus, Dry Shrub Deserts contain large amounts of desert sand and desert stone and often form large cliffs or canyons. Deserts are normally covered in desert sand, but at a few cliffs, the bare desert stone may be exposed without desert sand on top. 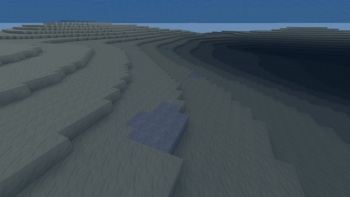 Deserts spawn underground rivers and lakes which can be over 200 blocks deep. 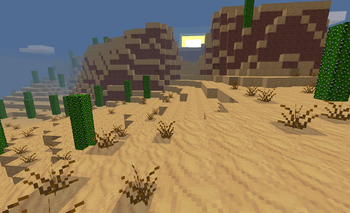 In Minetest Game, Cacti and dry shrubs also occour here naturally in clusters on desert sand. The cacti form in a “column” shape of up to 4 blocks high. Jungle Tree, Jungle Leaves, Jungle Grass Flower, Grass, Butterfly, Firefly Jungles contain large jungle trees which grow thickly packed together. 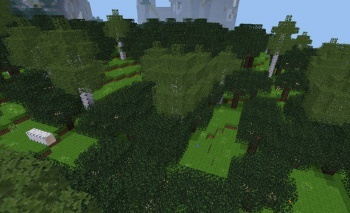 Jungle Grass and Jungle Trees bearing Jungle Leaves spawn here naturally. 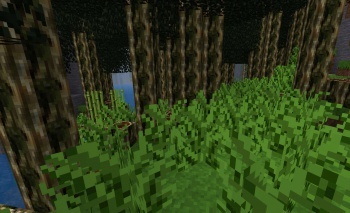 In Minetest Game, flowers and Grass might appear here, but only rarely so, the jungle grass generally dominates in jungles. Snow, Pine Tree, Pine Needles Dry Shrub The surface is covered with Dirt with Snow on top of Dirt or Stone. 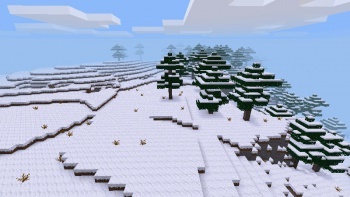 This biome includes snowed plains and snow-covered Pine Tree forests. In Minetest Game, some Dry Shrubs can be found here. 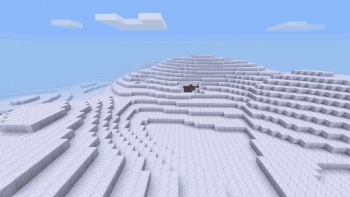 Tundra Snow Block, Dirt with Snow, Stone Tundras are areas of extreme cold and have large open fields with a surface of Snow Blocks on top of Dirt with Snow. There isn't any vegetation. They are essentially cold deserts. Landscape features form (more or less) separately from biomes. Sand beach Water, Sand, Clay, Stone Sand beaches are made out of sand and form at at height of Y=2 and below, which is near the sea level by default. Sand beaches often extend deep into the ocean, which can easily turn a large part of the ocean floor into sand. 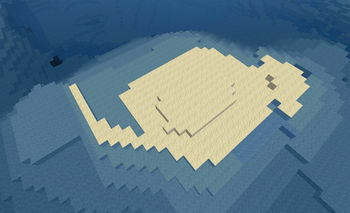 The sand replaces the floor of other biomes. 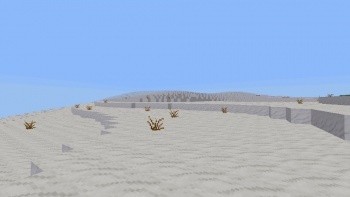 Depending on the terrain shape, sand beaches can be short or very long and wide (as seen in the screenshot). 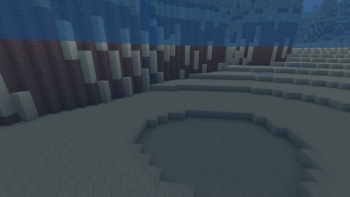 Clay can be found in the sand and forms in small to medium-sized “blobs” underwater (Technically, clay is generated like an ore by Minetest Game). 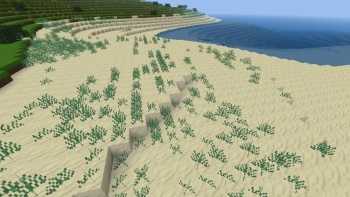 Sand beaches are generated based on height and Perlin noise; they technically form independent of the water of oceans. This effect can be noted if the water level (with the setting water_level) has been reduced. 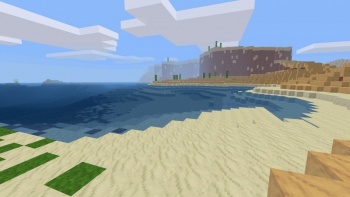 Ocean Water, Stone, Dirt, Sand An ocean is just a large body of water that reach a depth of around 25 blocks with the water surface at Y=0 worldwide (by default). The natural ocean floor is dirt (which is different from the other mapgens), but sand is also common because of sand beaches. Oceans usually spread across 250-300 blocks, but this can vary greatly. Oceans are a landscape feature that seemed to be implemented around 0.2.20110731_1 Pre-Alpha. Island All blocks from the v6 biomes, Water Islands occur many times in oceans. 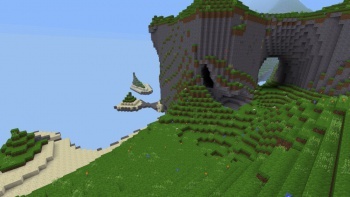 Islands usually raise out of the ground 3-10 blocks, but can get as large as 40-80 blocks tall. Ice sheet Ice, Water, Dirt, Sand Ice sheets are two layers of ice on top of ocean water. 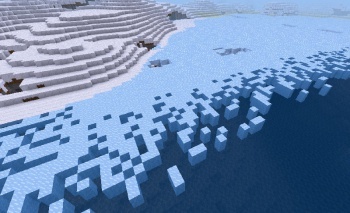 They generate when a tundra biome hits an ocean. Mountain Blocks are similar to those of forests and plains Mountains are the most treacherous to scale. Trees grow here naturally. It is quite easy to be killed in a mountain landscape if you don't pay attention to where you are going. 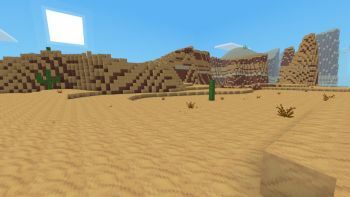 Plateau Almost all blocks from the v6 biomes A giant structure that seems to have appeared from version 0.4 on, plateaus are very common in deserts but also in mountainous terrain. 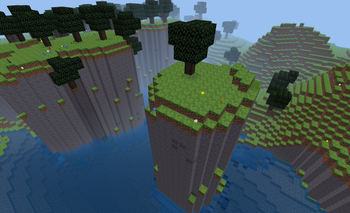 Plateaus can even float above ground and generate miniature biomes on top of it. Water cave Water, Stone Water caves are caves that only occur at sea level, which turn into a huge underground river or lake. 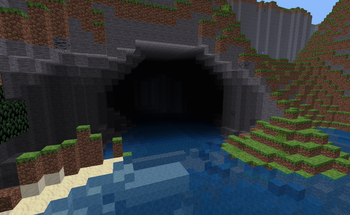 In extreme cases, these caves can lead thousands of blocks down and are extremely easily to get lost in. Gravel field Gravel Very rarely, unusually large gravel fields can appear on the surface. These areas consist of nothing but gravel. 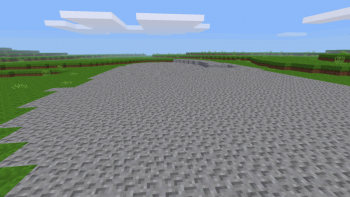 A gravel field can occour in any biome and simply replaced the surface material (e.g. dirt with grass) with gravel. Floatlands is an experimental feature of the v7 map generator. They are disabled by default. To use them, they have to be enabled with the setting mgv7_spflags first. Floatlands are floating pieces of land that float way above the ground level (Y=1280 by default). Like on ground level, there are various terrain shapes, like flat lands and huge mountains. In Minetest Game, the floatlands have 3 simple biomes, as of 5.0.0. This might change in future versions. 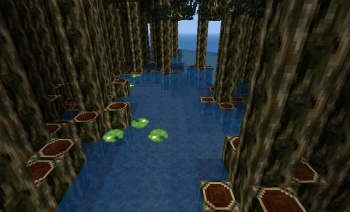 Also, all ores can be found in the floatlands frequently, they are often exposed at the bare terrain. But it's quite a hassle to go all the way up to the floatlands to reach them. Floatland grasslands Same as grasslands, plus all ores Floatland version of grasslands. This is basically the same, with the same ground blocks and vegetation. Like all floatland biomes, all the ores can be found here frequently. At the border of the floatlands, there are little sand “beaches” that are a bit shorter than in the ground-level grasslands. 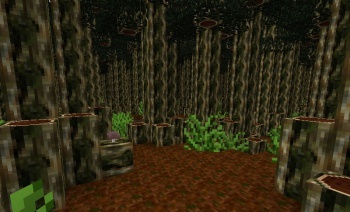 Floatland coniferous forest Same as coniferous forest, plus all ores Floatland version of coniferous forest. Floatland ocean Water, Sand, Clay, Stone, Ores Floatland ocean are bodies of water that are actually more like big lakes. They have the same materials as most of the ground-level oceans but due to the nature of floatlands, they are shaped in a very different manner. Floatland oceans are also generally much smaller than the “real” oceans. Usually these are surrounded by enough landmass so the water is safely locked inside the floating island. But imperfections in the cave generator might still punch some holes into the floor, creating enormous waterfalls that slowly extend all the way down to the ground level. 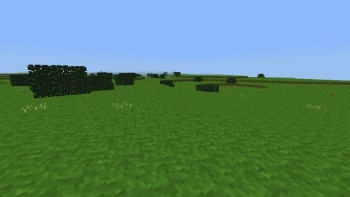 Before Minetest had version numbers, biomes were undefinable and only consisted of 4 materials: grass, stone, light and “water” (as seen in the images). 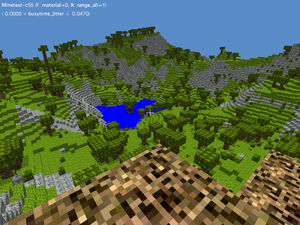 0.0.1: It brought actual biomes to the table, but before 0.2.20110529 Pre-Alpha map generation was a bit of a mess. Biomes would cross into each other, and were generally undefinable. 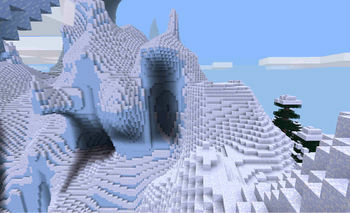 0.3.0 and before: Biomes were very basic. There were only grasslands, forests, oceans and beaches. 0.4.0: The map generator version 6 was introduced. This map generator had the same biomes as before in its early versions. Deserts and later jungles have been added later. 0.4.13: Taigas and tundras have been added to the v6 mapgen. Around this time, work on the Biome API has begun, but it was not useful yet. 0.4.14: The Biome API has been introduced for the v7 mapgen which allows mods to create their own biomes from scratch. This was a major milestone because the Biome API is much more flexible than the hardcoded v6 biomes; the biomes can be much richer now. All mapgens now support the Biome API, except v6, which continues to have its hardcoded biomes. 5.0.0: Vertical biome blending was added which gives a more smooth transition between biomes that stack vertically. Biomes can also be limited by constant X/Y/Z coordinates. Biomes can replace the material of dungeons and the liquid in caves. 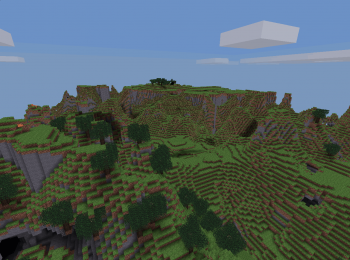 Before 0.4.14: Minetest Game did not create any biomes; all biomes were created by Minetest instead. Minetest Game merely added some decorations to the v6 mapgen, like flowers, papyri, cacti, etc. 0.4.14: Minetest Game started to use the new Biome API which made the v7 mapgen finally suitable for playing. 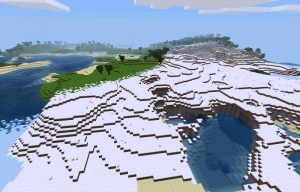 Minetest Game used the Biome API to add glaciers, ice sheets, tundras, taigas, stone grasslands, sandstone grasslands, coniferous forests, deciduous forests, deserts, savannas, rainforests, swamps and beaches. The v6 biomes are unchanged. 0.4.15: Snowy grasslands, cold deserts and sandstone deserts have been added. The sandstone grasslands have been removed. 5.0.0: Tundra, taiga and coniferous forest have been completely overhault. The tundra is covered with large fields of permafrost and snow. The taiga and coniferous forests feature new styles of pine tree and have a new dirt floor with lots of ferns. In the rainforests, there are sometimes emergent jungle trees that have a thicker trunk and grow much taller. Sandstone strata added to desert and sandsone desert. On the dunes there grows now marram grass instead of grass. 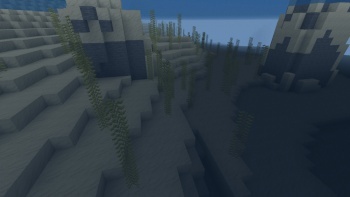 Kelp and rooted corals were added in the oceans. For more detail on the evolution of the map generator, see the Map Generator Evolution page. This page was last modified on 21 March 2019, at 05:48. This page has been accessed 26,604 times.